Members of the N.H. Preservation Alliance are a diverse, committed group. Here is a personality quiz to encourage you to think about your interests in historic preservation and support of the Preservation Alliance. Try to pick just one answer for each question, and consider our assessment below. A. Investigate the timber framing in a double-English barn, or mid-19th century Moses Kent murals a federal home. B. Visit all the meetinghouses in the Templeton Run, a linear dispersion of a distinctive design running north of Templeton, MA into New Hampshire. C. Prepare stirring testimony for a planning board hearing or talk to your state representative about the benefits of historic preservation investment. Which of these preservation icons would you like to be? A. Bob Villa, first host of This Old House. B. Part of the team that saved a historic mill, bridge, school, church or painted theater curtain. C. Dorothy Vaughn. Her activism in Portsmouth lead to the first use of urban renewal demolition funds for preservation in the U.S.
A. House by Tracy Kidder or The Moneypit. B. Midnight in the Garden of Good and Evil or The Building History of Northern New England by James Garvin. C. The Little House by Virginia Lee Burton or the Economics of Historic Preservation by Donovan Rypkema. · If you answered a lot of As, you are likely an old house or barn enthusiast. · If you answered a lot of Bs, you are likely a community landmark advocate. Perhaps caring for an old town hall, church or helping with other civic issues in town. · If you answered a lot of Cs, you are likely a preservation activist involved in lots of different aspects of preservation activity. The Preservation Alliance needs all types to help us do more! We support you; please support the Preservation Alliance today. The signs announcing Grafton's Ruggles Mine are a fixture along Route 4 and 104. They’re painted brown and look a little homemade. Some announce the former tourist attraction as “world famous,” which maybe convinces some, but may come across as a little grandiose. And yet, Preservation Alliance field service representative Andrew Cushing notes that his grandparents love to tell a story about their vacation out West in the 1970s when someone pointed to their station wagon’s wooden rooftop cargo box emblazoned with “Grafton, NH” and shouted across the parking lot, “Hey, Ruggles Mine!” Those "world famous" brown signs seemed a little more believable after that. After closing its door as a visitor destination in 2016, the future of Ruggles Mine has remained in limbo. Several price cuts failed to attract serious bids and the site has been subject to trespassing and vandalism – Grafton’s sole police officer can attest. The New Hampshire Preservation Alliance approached officials in the N.H. Division of Parks and Recreation several months ago and proposed the site become the newest state park. While it would not be a conventional park, it would be a unique offering that combined historical, geologic, and natural features as well as incredible scenery. Its 235 acres is mostly forested, is adjacent to the Forest Society’s Grafton Pond Reservation and Blodgett Forest, and it sits squarely within the Quabbin to Cardigan Initiative. 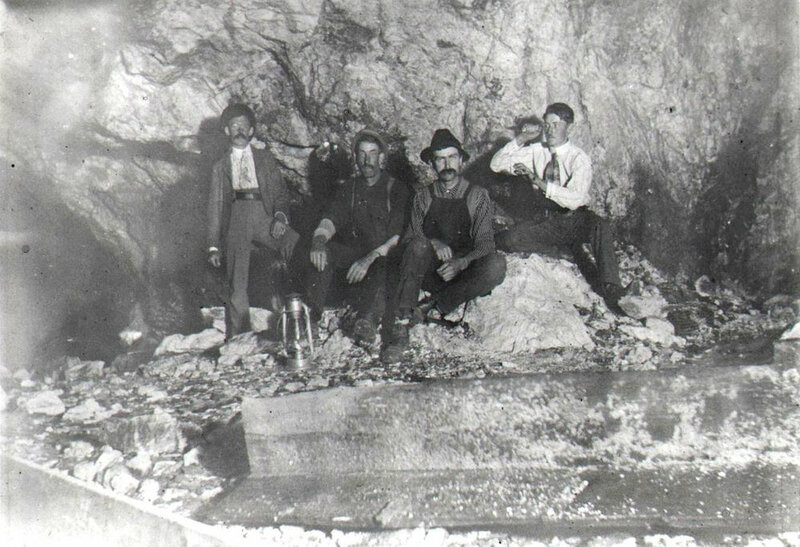 1911 crew at Ruggles Mine. 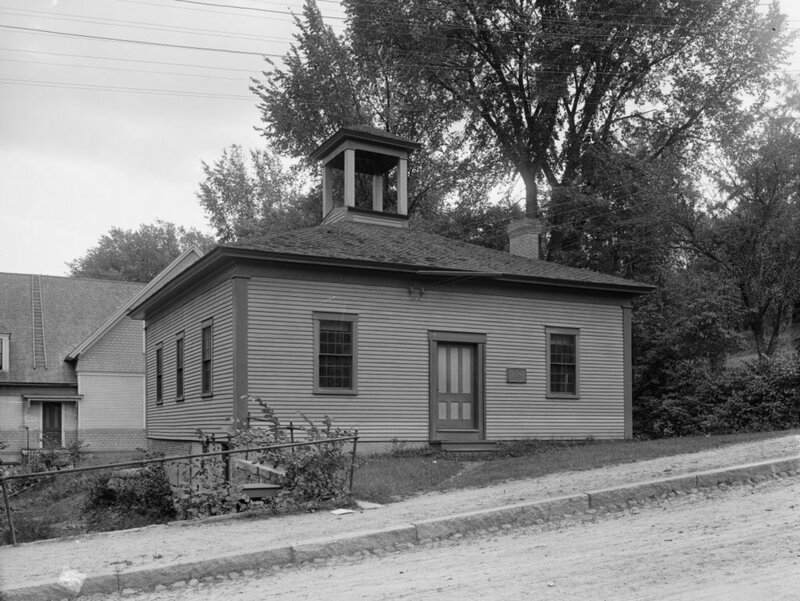 Courtesy Grafton Historical Society. The mine has tremendous historical value, not only to the state but the country. New Hampshire may be the Granite State, but the western hill towns of the state were especially known for their mica mines. Mica mines were common in the towns of Alstead, Gilsum, Grafton, and Groton, where the material would be used in lanterns and stove windows – and later, for electrical insulators. Ruggles was the first mica mine in the United States. (In fact, before the Civil War, New Hampshire produced all of the mica in the United States.) Samuel Ruggles started mining in earnest in 1803, though records suggest that mica had been discovered in Isinglass Mountain as early as the 1770s. (Samuel Ruggles was actually more of an investor than a farmer or miner.) What ensued was over 150 years of active mining during which Ruggles was the largest mica and feldspar mine in New Hampshire. The result was a scarred landscape with spectacular pegmatitic arches. When the mine closed in 1962 due to changes in the global markets, the site was purchased as a tourist attraction. Between 1962 and 2016, the mine welcomed rock hounds and curious families alike, with the draw being the ability to hammer away in hopes of finding gems or rocks. The Preservation Alliance is pleased that the N.H. Division of Parks and Recreation is actively exploring whether the property meets its mission as well as financial and operational issues. New Hampshire has nearly one hundred state parks, including mountain peaks, lakeside beaches, gorges, and historic sites. Because the state’s park system is largely self-funded, new additions are rare. (Jericho Mountain State Park in Berlin is the newest member of the park family, purchased in 2007.) Ruggles could provide income to the state park system – and creative types have already suggested using the mine for concerts or outdoor art exhibits, such as the one created by the Revolving Museum in 2017. Such an endeavor will take time, money, and imagination. The result, however, will be an important landscape preserved for the future. Support for such an initiative can surely be...mined. The view from the parking lot at Ruggles Mine affords northerly views toward Mount Cardigan. Are you supporting preservation and conservation with a Mooseplate? Do you know that funds from Moose Plate sales support a wide variety of conservation, heritage and preservation programs in New Hampshire, including planting wild flowers along New Hampshire highways, studying threatened plant and animal species, securing conservation easements and preserving publicly owned historic properties and artifacts? The Preservation Alliance hopes that you’ll get a plate if you don’t have one, or buy one as a gift for a friend. Every dollar raised through the sales of Moose Plates goes directly to supporting designated programs. More than $20 million has been raised since the program began and projects in all 10 New Hampshire counties have benefited from Moose Plate funds. 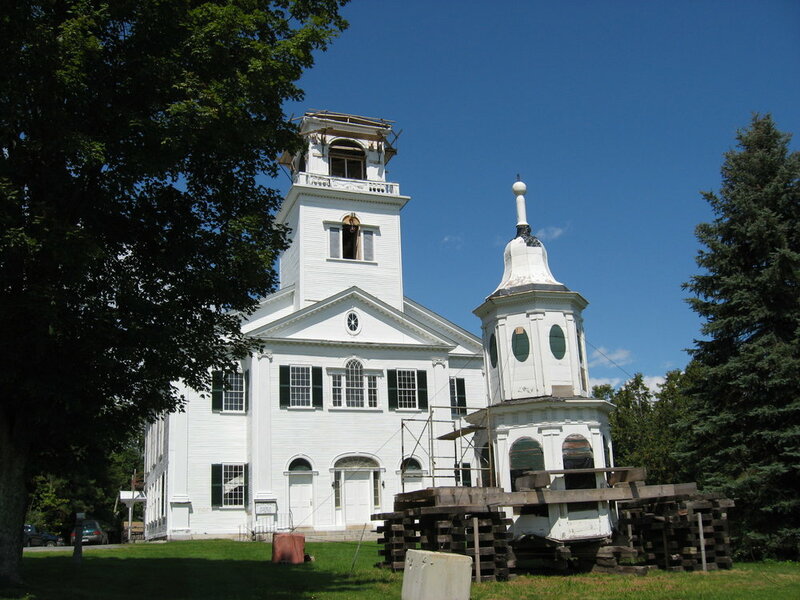 Examples of preservation projects include the restoration of a town-owned barn in Cornish, roof stabilization for the Bartlett Roundhouse, and the renovation of the balcony in the Gorham Town Hall (right). Preservation gets more attention, and travelers on New Hampshire’s roadways this summer have something new to watch for when they play the license plate game: the state’s popular Moose Plate program has added the letter “P” to plate combinations. When the first Conservation Number Plates were issued in December 2000, the letter “C,” for “conservation,” was part of each standard five-digit number combination. As “C” plates sold out, the letter “H,” for “heritage,” replaced the “C.” This spring, the first plates with the letter “P,” for “preservation,” were issued. Standard combination Moose Plates still include a stacked “C” for “Conservation” and “H” for “Heritage” next to the illustrated moose, which was designed by Granite State artist Jim Collins. 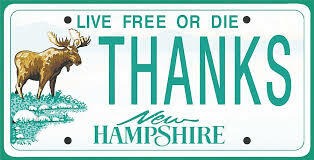 New Hampshire’s motto “Live Free or Die” is also part of the plate’s design. Moose Plates may be purchased at city and town clerks’ offices when registering a car or truck. The annual cost for a Moose Plate is $30; the first year requires a standard $8 plate purchase fee. Vanity Moose Plates and combination Moose / NH State Parks plates are also available for additional charges. Fourth grade students from Holderness Central School started the idea for the Moose Plate program in 1993. Legislation establishing the program passed in 1998. More information is available at mooseplate.com. For more on historic and cultural projects, check here.